I have made a terrible oversight. An omission of the highest order. I have been chattering away on this blog for nearly three years and I have not once introduced you to Coolatai’s claim to fame. Our legend. The story that put us on the map. Coolatai has a black panther. 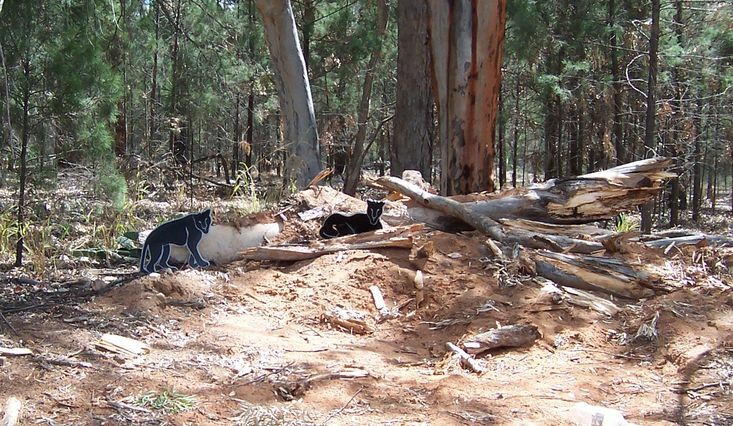 Here in Australia there have always been whispers of a mysterious black panther slipping quietly through the bush. This may seem unremarkable to the rest of the world but Australia is an island continent and the closest we have to a large feline is a house-cat or the Tasmanian Tiger, which we shot out of existence back in the 1930s. So a panther is quite exciting. The story made headlines in the national press. Old Coolatai –ites came forward with sightings dating back a decade. Another young bloke was holed up in his caravan all night as the panther prowled around outside. Even a visiting Sydney pianist insisted he had seen the panther on the road. The Wallaroo Hotel fattened on the rumours. The legend grew. In 1995 a book titled “Mysterious Australia” was published and an expert stated the panthers (note the use of the plural – obviously there had been a breeding program) lived in Coolatai and made an annual migratory pattern through-out the north-west. Today there is a painting in the Wallaroo Hotel showing the black panther attacking a huge black feral pig; and though no tracks, nor skins, nor bodies have ever been found, the stories persist. 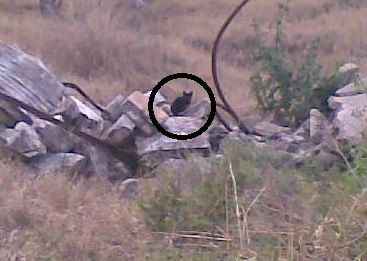 A report in the esteemed Coolatai Bush Telegraph only a few years ago suggested there were panther kittens living under a local house and fleeting black shapes are common on the road home from the pub. But what of photos I hear you ask? Well these are what I have obtained from dogged research. Behold and be amazed. This entry was posted in Panther Tales and tagged Australian Legends, Black Panther Legend, Black Panthers in Australia, Coolatai, Coolatai Black Panther. Bookmark the permalink. Similar maybe Lavinia but I don’t perceive our panther as being fearsome or particularly mythical – more of a novelty. And yet I detect some cynicism between the lines. You must believe! I think I am a believer Lyle, and although I have no proof I am happy to perpetuate the myth until I do. My partner and I saw the black panther at Coolatai on Sunday 2/7/2017, coming home from a dirt bike event. We saw the rare end of it, from behind the last ribs, it’s haunches and tail. It was stalking a roo and it’s joey which were on the road. We tooted the car horn to clear the Roos from the road and we startled it so it turned and ran into the roadside grass. We didn’t see the front end, just the back half. It was definitely a panther back end and about mid thigh height on an average male adult in size. Wish you had had a camera Sonia (I bet you do too). I’m a little envious – I have not seen the panther yet but it is good to hear he is still around. Do you have dash cam footage or were the chips blocking the view? We saw it on the Coolatai Road. We were heading towards Wallangra from Coolatai and we were about 5kms out of Coolatai. We left Coolatai heading toward Yetman (10 to 20 Ks) are we talking the same area. Very similar area. Where you were heading north, we were heading east from Coolatai. But if you drew a straight line between where you saw it and where I saw it, it would only be about a 15km difference. Sorry if I offended you Keith, that certainly wasn’t my intention. I wasn’t being a smart arse, I genuinely thought you meant you had a bag of chips blocking the dash cam – I read your post wrong. Again, sorry for that, and I do believe you and what you saw – if you look at recent posts to this site, you will note that I, too, have seen the panther. No need to be rude and nasty!